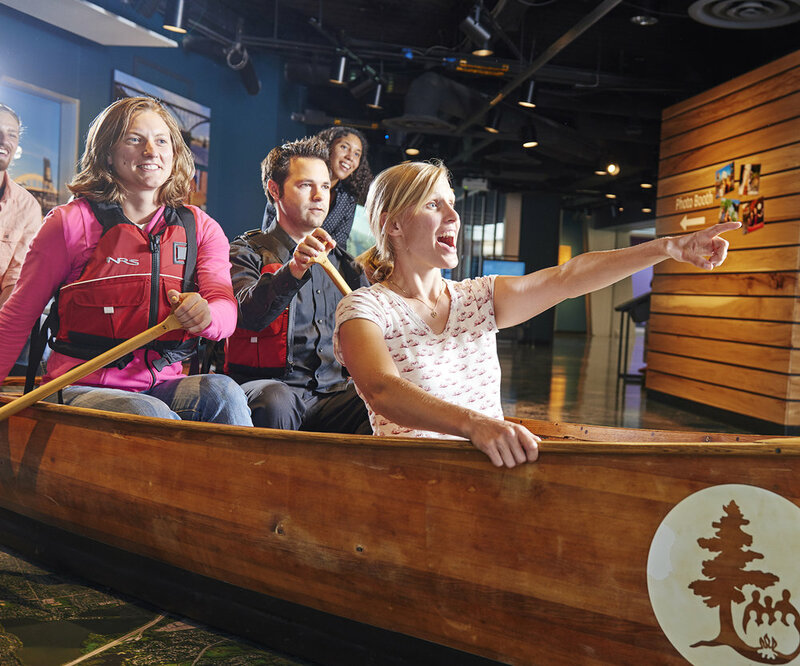 Just inside the lobby of the Science Museum of Minnesota, the Mississippi River Visitor Center provides a gateway to national park adventures along the Mississippi River. 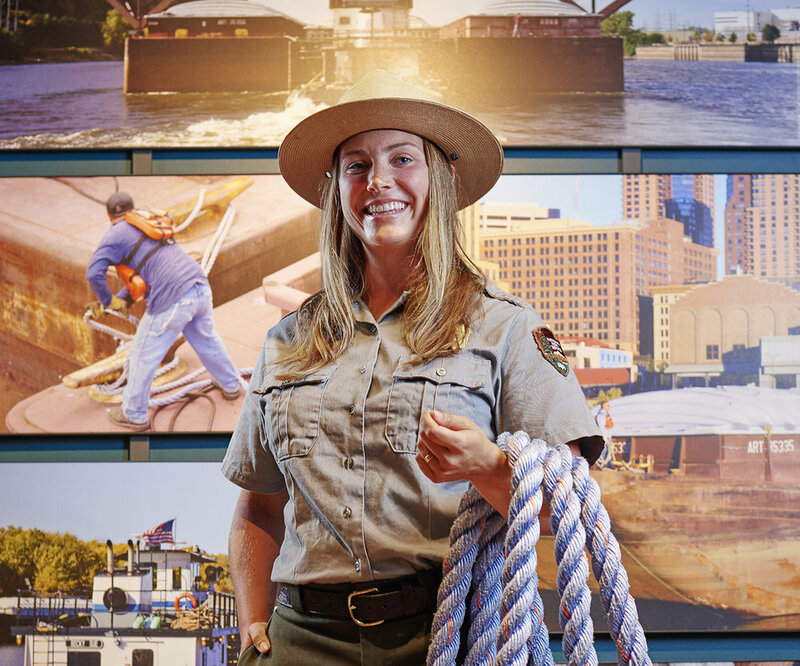 Operated by the National Park Service and staffed by friendly rangers and volunteers, the Mississippi River Visitor Center is the perfect starting point to discover your river! Meet the Albert Gustaveson! This canoe was one of the first Wilderness Inquiry Voyageur canoes made by former WI staff member, Al Gustaveson. Thanks to Wilderness Inquiry's generous donation, it is now a permanent exhibit of the Mississippi River Visitor Center, and allows visitors to explore several stretches of Mississippi National River and Recreation Area from the Science Museum lobby. 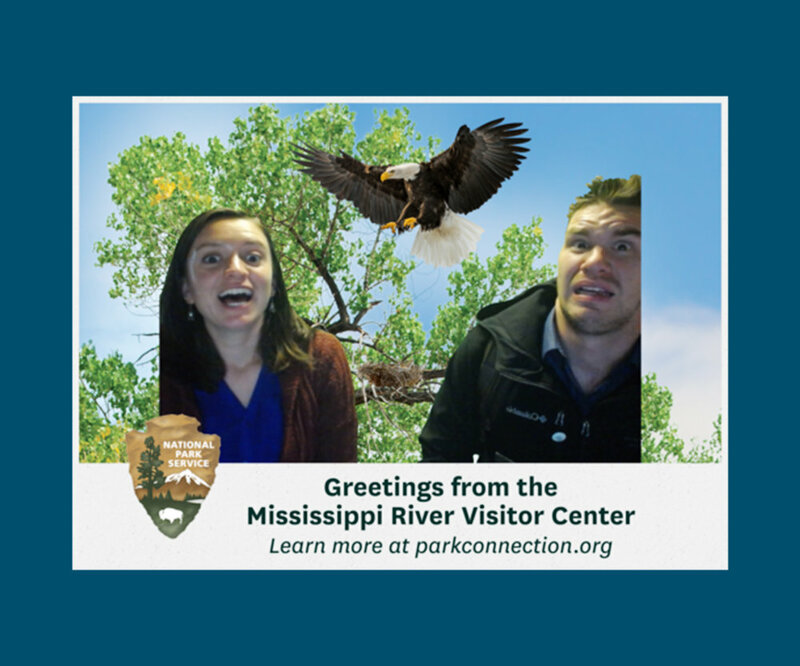 Send your friends a funny postcard from the Mississippi River Visitor Center. Simply enter the photo booth, select your backdrop and props, and email or upload your postcard. With loads of backgrounds and fun props to pick from, you'll be sure to delight them with your photos! Experience what it would be like to work on a barge, and even learn the lingo! This exhibit allows you to try your hand at knot-tying with a very heavy rope and two real timberheads and a kevel bolted to the floor. Try it out on your own or let a ranger show you the ropes! Experience a motion-detection video game that gives visitors an aerial view of the Mississippi River in downtown Saint Paul and an opportunity to experience the river from a birds eye. Spread your wings and fly over the mighty Mississippi to look for fish to bring to your darling eaglets! 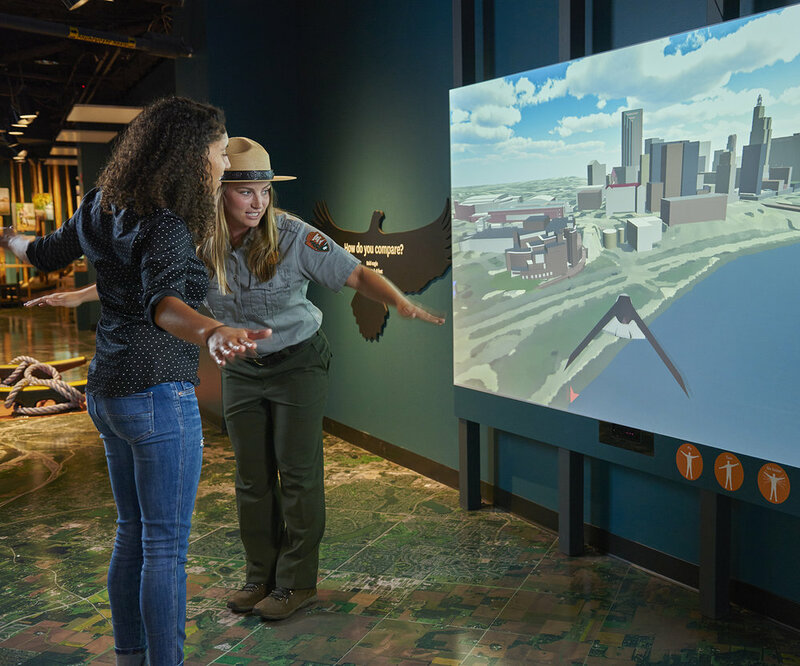 Alongside this fun, interactive game you'll find more information about the bald eagles of Mississippi National River and Recreation Area. The visitor center is only open during the summer season from Memorial Weekend to the end of September. Call 952-303-2706 for more information or 651-293-0200 during the off season or when this visitor center is closed. The National Park Service began operating the Upper St. Anthony Falls Lock and Dam Visitor Center in spring of 2016 to provide tours and interpretation to the public after the closure of the lock in 2015. During the summer, the visitor center is open 9:30 am to 5 pm daily, through Labor Day weekend. Tours of the lock wall happen daily at 11am, 1pm, and 3pm. The observation deck at the Upper St. Anthony Falls Lock and Dam Visitor Center provide spectacular views of the falls, the iconic Stone Arch Bridge, and the surrounding milling district of downtown Minneapolis. The visitor center features exhibits that provide information about the falls, locks and dams, and their place in our state's history. Come down to get to know the Mississippi National River and Recreation Area, see panoramic views of St. Anthony Falls, take a guided tour out onto the lock wall, and learn how the falls changed the course of history of the area and the nation. National Park Service rangers are available to answer questions, give tours, issue national park passes, and officiate junior rangers. View of the Upper St. Anthony Falls Lock and Dam from the Stone Arch Bridge. 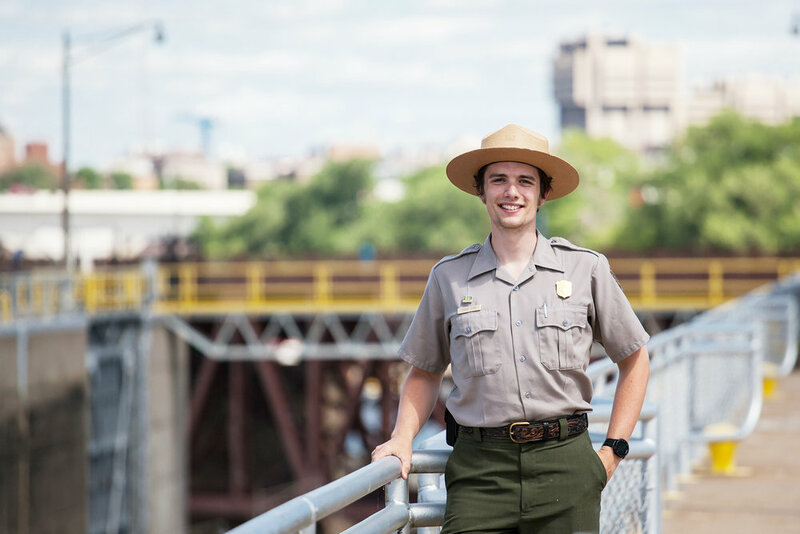 National Park Service ranger at Upper St. Anthony Falls Lock and Dam.